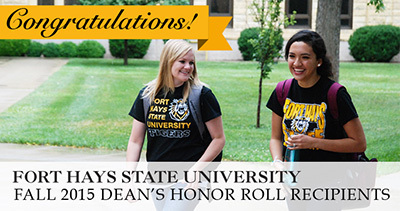 HAYS, Kan. -- Local students are among the 1,279 named by Fort Hays State University to the Dean's Honor Roll for the fall 2015 semester. Students are listed alphabetically by county and city, state and city or country and city with their classifications and, for those who have declared them, majors. Students without a classification are students seeking a second degree or are students who, though full time, are not seeking a degree. Iola: Shana Kay Bennett is a senior majoring in education. Pamela A. Gentry is a senior majoring in elementary education. Trisha Marie Penning is a senior majoring in agriculture (animal science). Lancaster: Steven Kenneth Rathert is a senior majoring in music (music education). Kiowa: Mikala Lyn Gillig is a junior majoring in radiologic technology. Claflin: Layne Charles Bieberle is a freshman majoring in technology studies (construction management). Peyton D. Broeker is a sophomore majoring in communication sciences and disorders. Aubrey Lynn Kempke is a junior majoring in accounting (public). Kevin William Klug is a senior majoring in biology (pre-med and pre-dentistry track). Shelby L. Letourneau is a sophomore majoring in radiologic technology. Ellinwood: Kristi Lynn Dewerff is a senior majoring in elementary education. Rachel Marie Doll is a freshman majoring in education. Brandon Michael Ball is a freshman majoring in technology studies (education). Selam Caren Ball is a freshman majoring in chemistry (biochemistry). Matthew L. Bruner is a sophomore majoring in accounting (public). Amy Lynn Christopher is a junior majoring in radiologic technology. Abigail Joan Hammeke is a senior majoring in justice studies. Katelyn Nicole Henning is a senior majoring in health and human performance (sport management). Elizabeth A. Swigart is a junior majoring in social work. Nathan C. Towns is majoring in secondary education. Grant Edward Unruh is a freshman majoring in agricultural business. Ashley Denise Wieland is a junior majoring in psychology. Joanne Renee Wondra is a senior majoring in sociology. Mallory Jo Flagor is a senior majoring in health and human performance (health promotion). Abiagail Jo Morrison is a senior majoring in elementary education. Matraca Lane Ochs is a junior majoring in English (teaching). Andover: Jennifer Lester is majoring in education. Augusta: Heather Renee Spyres is a sophomore majoring in information networking and telecommunications (Web develeopment). Caleb J. Strack is a freshman majoring in accounting. Alexandra M. Taylor is majoring in education. Kassidy Hope Thompson is a sophomore majoring in nursing. Elbing: Richard Kent Wright is majoring in education. Leon: Alexander J. Muckenthaler is a senior majoring in management. Potwin: Caleb John Cherryholmes is a junior majoring in nursing. Rose Hill: Tori Nicole Beltz is a senior majoring in psychology. Towanda: Joshua David Griffis is a senior majoring in education. Cottonwood Falls: Rebecca Louise Turner is majoring in education. Cedar Vale: Aspen Daniell Haden is a junior majoring in education. Sedan: Teresa Faye Jackson is a sophomore majoring in organizational leadership. Jalyn Nicole McCauley is a senior majoring in general studies (general business). Ashlee Nicole Orth is a freshman majoring in education. Christina Gayle Gillum is a sophomore majoring in psychology. Jay Andrew Luerman is a senior majoring in agricultural business. Minneola: Joseph Todd Harrington is a freshman majoring in physics. Clay Center: Megan Nicole Carlson is a sophomore majoring in nursing. Alisha Gayle Evans is a senior majoring in elementary education. Macy Linea Franson is a freshman majoring in radiologic technology. Alyssa Lynn Steppe is a junior majoring in political science. Morganville: Ricky James Huse is a freshman majoring in computer science. Lorren B. Williams is a freshman majoring in nursing. Concordia: Emily Anne Brown is a junior majoring in education. Kayla Nicole Champlin is a senior majoring in chemistry (teacher education). Jordynn Elise Gumm is a junior majoring in education. Amanda Louise Lawrence is a junior majoring in education. Joshua D. Pounds is a junior majoring in technology studies (industrial). Jamestown: John James McClintock is a senior majoring in computer science. Waverly: Allie Jo Rice is a senior majoring in education. Abby Leigh Gales is a freshman majoring in health and human performance (sport and exercise therapy). Wilmore: Brenna L. Lawless is a freshman majoring in biology (wildlife). Arkansas City: Patrick Celestine Burton is a junior majoring in education. Julie Ann Coldwell is a junior majoring in psychology. Karli Nichole Foy is a senior majoring in elementary education. Rachel Louise McAfee is a junior majoring in education. Rakiyah M. Taylor is a senior majoring in management (human resource management). Anna M. Legleiter is a senior majoring in general studies (general business). Pittsburg: Toni Lynn David is a senior majoring in psychology. Oberlin: Keithen Merle Fortin is a senior majoring in agriculture (animal science). Baron Jon Green is a sophomore majoring in justice studies. Alyshia K. Anguiano is a senior majoring in art education. Krista Lee Bacon is a sophomore majoring in health and human performance. Brittany Marie Duer is a freshman majoring in agriculture (agronomy). Jenna Ann Klein is a freshman majoring in biology (pre-med and pre-dentistry track). Stefanie Renee Laudick is a sophomore majoring in nursing. Lindsey Beth Hurford is a freshman majoring in nursing. Solomon: Laura Elizabeth Edwards is a junior majoring in social work. Alexa Jo Ritter is a freshman majoring in radiologic technology. Highland: Caleb Michael Lackey is a senior majoring in music (music technology). Baldwin City: Jesse Conn Enright is a junior majoring in health and human performance (exercise science). Sharon Kay Fritzsche is a senior majoring in elementary education. Brittnay Taryn George is a junior majoring in nursing. Morgan C. Gerstmann is a junior majoring in technology studies (industrial). Darian N. Graham is a junior majoring in nursing. Melissa Marie Howard is majoring in elementary education. Lawrence: Rachel Quillen Eichhorn is a junior majoring in health and human performance (gerontology). Lisa Lynn Foster is a junior majoring in general studies (psychological). Corbin David Robinson is a sophomore majoring in art (graphic design). Ariel John Rodriguez is a senior majoring in elementary education. Lewis: Daniel A. Saenz is a freshman majoring in political science. Ellis: Kori Lea Clark is a freshman majoring in psychology. Sidney Ann Gottschalk is a sophomore majoring in athletic training. Wanda Paola Jimenez is a sophomore majoring in biology. Jared Michael Knoll is a junior majoring in management. Alicia Laurel Kroeger is a junior majoring in business. Sarah Jane Mick is a freshman majoring in communication sciences and disorders. Jordan Michael Rohr is a junior majoring in business. Jensen Nicole Scheele is a junior majoring in athletic training. Tyler Gary Walters is a freshman majoring in geology. Magdalen Anne Zody is a senior majoring in music. Olivia Anne Zody is a junior majoring in elementary education. Hays: Omar Almulhim is a senior majoring in information networking and telecommunications (computer networking). Jessica Renae Babyak is a freshman majoring in art (graphic design). Megan Anita Balman is a senior majoring in elementary education. Molly Ann Barnett is a sophomore majoring in art (graphic design). Naomi Elizabeth Basgall is a junior majoring in general studies. Laurie J. Beard is a junior majoring in health and human performance (health promotion). Taran Nichole Becker is a senior majoring in English. Dillon R. Bell is a senior majoring in applied technology. Rylee Michelle Broyles is a sophomore majoring in political science. Christian J. Burd is a freshman majoring in philosophy. Faith Christine Burdine is a junior majoring in psychology. Tristan Martin Callis is a freshman majoring in chemistry. Troy A. Carner is a freshman majoring in general studies. Taissa T.V. DasilvaCarvalho is a freshman majoring in psychology. Kaitlyn Elizabeth Dinges is a senior majoring in organizational leadership. Casey Lee Dinkel is a freshman majoring in nursing. Megan Rose Dinkel is a sophomore majoring in biology. Shelby Mae Dinkel is a junior majoring in accounting (public). Candace Leigh Domann is majoring in nursing. Nicholas Dean Dopita is a junior majoring in technology studies. Nathan Laine Felton is a junior majoring in psychology. Nicole Elizabeth Feyerherm is a sophomore majoring in English. Allyson Rachelle Flax is a freshman majoring in radiologic technology. Zack Michael Gaughan is a senior majoring in physics. Joseph Thomas Glassman is a senior majoring in technology studies (construction management). Nicholas Isaac Glassman is a junior majoring in accounting. Randy Lee Gonzales is majoring in communication (journalism). Heidi Marie Gottschalk is a freshman. Chelsea Elaine Greenough is a sophomore majoring in organizational leadership. Kellen Lynn Griffin is a junior majoring in mathematics (teaching). Kirsten Renee Haas is a sophomore majoring in art. Kyle L. Hadley is a senior majoring in history (secondary education). James Robert Hahn is a senior majoring in art (studio). Alexandria Rachelle Harm is a senior majoring in nursing. Bryan Matthew Hirsch is a sophomore majoring in history (secondary education). Taylor Leigh Hodny is a sophomore majoring in radiologic technology. Aaron F. Hoffman is a senior majoring in physics. Conrad Raymond Hoffman is a freshman majoring in information systems engineering. Allison E. Hohmann is a sophomore majoring in education. Parker Eugene Holterman is a junior majoring in management. Kasey Mae Hoyt is a senior majoring in education. Brady Joseph Hutchison is a freshman majoring in technology studies. Joshua Allen Jecha is a freshman majoring in information networking and telecommunications (computer networking). Michaela Marie Jochem is a junior majoring in technology studies. Courtney M. Keener is a sophomore majoring in social work. Alyssa Grace Keil is a freshman majoring in health and human performance. Hannah Leigh Keil is a senior majoring in communication sciences and disorders. Adam J. Klaus is a freshman majoring in finance. Amber E. Klaus is a freshman. Austin Miles Knoll is a senior majoring in accounting. Shante Alise Korbe is a sophomore majoring in radiologic technology. Russell William Krug is a freshman majoring in geology. Kaitlyn Elizabeth Lammers is a senior majoring in art. Alexyss L. Leiker is a senior majoring in biology (pre-med and pre-dentistry track). Bailee Renae Leiker is a freshman majoring in radiologic technology. Emily Katherine Leiker is a junior majoring in tourism and hospitality management. Eli J. Lohrmeyer is a freshman majoring in biology. Rachel Megan Luedders is a freshman majoring in tourism and hospitality management. Paige Nicole Lunsford is a senior majoring in health and human performance (recreation). Courtney Shayanne Maska is a senior majoring in health and human performance. Jacob William McCoy is a senior majoring in technology studies (industrial). Ethan Kane McKinney is a senior majoring in technology studies (construction management). Kade Scott Megaffin is a junior majoring in accounting (public). Monica Rose Michaud is a sophomore majoring in information systems engineering. Ashley Renee Moore is a senior majoring in organizational leadership. Payton L. Nowlin is a sophomore majoring in health and human performance (fitness programming). Drew Anthony O'Brien is a senior majoring in marketing. Cameron Joseph O'Connor is a junior majoring in health and human performance. Aaron Michael Orth is a sophomore majoring in music (music technology). Kara Lynn Paramore is a senior majoring in art (graphic design). Jarred Alan Penton is a freshman majoring in physics. Kaylie Sue Reeh is a sophomore majoring in nursing. Curtis Alan Renz is a freshman majoring in management. Amanda Micaela Rivera is a junior majoring in art education. Kenny Allen Rounkles is a sophomore majoring in radiologic technology. Shaunna Marie Ruder is a senior majoring in education. Chandler Dalton Rule is a junior majoring in justice studies. Alexis Deann Schaben is a freshman majoring in communication sciences and disorders. Mattison Lynn Schlaefli is a freshman majoring in biology (pre-med and pre-dentistry track). Shelby Katherine Schumacher is a sophomore majoring in psychology. Christopher Glenn Simmons is a senior majoring in information networking and telecommunications (computer networking). Candace Mae Staab is a senior majoring in studio art (painting). Spencer Joseph Staab is a senior majoring in geology. Shelby David Steffen is majoring in education. Garrett C. Stoecklein is a sophomore majoring in chemistry. Courtney Jo Storer is a junior majoring in radiologic technology. Arin Elizabeth Straub is a junior majoring in nursing. Alexis Marie Summers is a freshman majoring in nursing. Anna Rose Taylor is a senior majoring in elementary education. Liliane Vallee-Stremel is a freshman. Aislinn Walters is a sophomore majoring in music (music education). Alexis Kay Wasinger is a freshman majoring in information networking and telecommunications. Austin James Werth is a junior majoring in radiologic technology. Braiden Joseph Werth is a freshman majoring in biology (pre-med and pre-dentistry track). Britney Lynn Werth is a freshman majoring in education. Mackenzie Kay Wiley is a senior majoring in communication sciences and disorders. Janna Lanae Wilkinson is a senior majoring in organizational leadership. Brianna Marie Wooldridge is a junior majoring in mathematics (teaching). Ryan James Wooldridge is a senior majoring in general science. Corinne Elizabeth Ziegler is a junior majoring in accounting. Shane Michael Zimmerman is a junior majoring in geology. Schoenchen: Christopher L. Zeman is a freshman majoring in international business and economics. Victoria: Melanie Marie Burton is a junior majoring in radiologic technology. Ashley Marie Dome is a junior majoring in education. Audra Katelynn Nowak is a sophomore majoring in radiologic technology. Sam Lincoln Ottley is a sophomore majoring in management (human resource management). Rebecca Ann Stewart is a sophomore majoring in agriculture (animal science). Ashley Maree Templeton is a junior majoring in organizational leadership. Mckenzie Alexa Thrasher is a freshman majoring in nursing. Garden City: Levi Edward Allen is a junior majoring in management. Misael Banderas is a junior majoring in technology studies (construction management). Lindsay Brooke Bradstreet is a freshman majoring in radiologic technology. Karla Geraldina Herrera is a junior majoring in communication sciences and disorders. Hannah J. Lindo is a junior majoring in art. Gloria Marquez is a junior majoring in health studies. Thao Phuong Nguyen is a senior majoring in art (graphic design). Antonio Manuel Ochoa is a senior majoring in general studies (general business). Elias Prieto is a senior majoring in technology leadership. Daisy Reyes is a senior majoring in elementary education. Katharine Renae Sexson is a senior majoring in elementary education. Breckan Leigh Shrimplin is a senior majoring in early childhood unified. Holcomb: Susan Renee Hornbaker is a senior majoring in English (writing). Kristin Dawn Roth is a senior majoring in English (writing). Luis A. Salazar is a junior majoring in art (graphic design). Bucklin: Janae E. Price is a freshman majoring in organizational leadership. Dodge City: Erica Sue Alarcon is a senior majoring in justice studies. Mckayla Dawn Bacon is a junior majoring in education. Sydney Kathleen Heimerman is a senior majoring in mathematics (teaching). Gabriela Hernandez is a senior majoring in psychology. Armando Rubio is a freshman majoring in accounting. Chantel Sanchez is a junior majoring in art (graphic design). Morgan Renee Schaller is a senior majoring in chemistry. Kimber L. Smith is a sophomore majoring in education. Jacob Charles Thomas is a junior majoring in biology (pre-physical therapy). Ty D. Thomas is a senior majoring in health and human performance (K-12 teaching and coaching). Zachariah R. Utley is a junior majoring in finance. Taylor Dylan Wade is a senior majoring in nursing. Spearville: Trisha Ann Hines is a senior majoring in early childhood unified. Eric N. Crook is a senior majoring in physics. Princeton: Nastasja Diane Bosserman is a senior majoring in communication sciences and disorders. Junction City: Katie Lynn Cech is a sophomore majoring in business education (corporate communication). Gove: Taylor Lynn Tustin is a freshman majoring in athletic training. Grainfield: Tuker John Gillespie is a sophomore majoring in agricultural business. Anthony Leo Dinkel is a sophomore majoring in justice studies. Brooke Elizabeth Ostmeyer is a junior majoring in biology (pre-occupational therapy). Quinter: Stephanie Kay Albin is a senior majoring in early childhood unified. Logan T. Reed is a senior majoring in computer science. Blaine Thomas Wertz is a freshman majoring in biology (pre-med and pre-dentistry track). Hill City: Shelby K. Stewart is a junior majoring in organizational leadership. Ness City: Nichole R. Dearinger is a freshman majoring in general studies (massage therapy). Ulysses: Kalea Janae Barlow is a senior majoring in general studies (child development). Elpidio Cortez is a junior majoring in accounting. Colby Cheyenne Hagerman is a senior majoring in nursing. Cimarron: Britney Larae Bogner is a freshman majoring in business. Colbi M. Brooks is a junior majoring in education. Avery D. Burns is a senior majoring in health and human performance (exercise science). Claire Suzanne Nash is a senior majoring in biology (pre-physical therapy). Kristina Lynn Peters is a senior majoring in general studies (criminal justice). Copeland: Katelyn Rene Unruh is a junior majoring in education. Makayla M. Unruh is a sophomore majoring in health and human performance (sport and exercise therapy). Ingalls: Isaac Matthew Baxa is a freshman majoring in history. Montezuma: Cassy Denae Watson is a freshman majoring in education. Tribune: Heather Ann Myers is a senior majoring in elementary education. Courtney Gail Nemechek is a senior majoring in general studies (biological). Troy Onsby Wineinger is a junior majoring in health and human performance (sport and exercise therapy). Eureka: Kayla Ashley Davison is a senior majoring in elementary education. Syracuse: Michael Lee Wilson is a senior majoring in psychology. Anthony: Jonathan Daniel Stainbrook is a senior majoring in management. Attica: Cody Lea Yeager is a senior majoring in geology. Morgan Elise Klassen is a senior majoring in organizational leadership. Craig Stutzman is a senior majoring in organizational leadership. Sedgwick: Kathy Mae Schale is majoring in elementary education. Satanta: Daniel Lee Garcia is a junior majoring in general studies (general business). Kacey Renee Smith is a junior majoring in psychology. Sublette: Max Wade Patterson is a senior majoring in music (music technology). Aubrey Ann Roths is majoring in elementary education. Taryn Weilert is a freshman majoring in chemistry. Whiting: Sandra L. Patterson is a senior majoring in sociology. McLouth: Travis P. Riley is a freshman majoring in biology. Oskaloosa: Trisha Boyd is a senior majoring in early childhood unified. Ozawkie: Jacquelyn Leigh Maline is a freshman majoring in education. Taylor Insook Willits is a junior majoring in psychology. Perry: Halsten Michelle Coyle is a sophomore majoring in medical diagnostic imaging. Esbon: Chase Michael Wagner is a sophomore majoring in agricultural business. Gardner: Garrett L. Mullins is a sophomore majoring in finance (banking). Lenexa: Natalie Ann Lautt is a senior majoring in elementary education. Cera Marie Smart is a senior majoring in biology (botany). Jessica Nicole Wesley is a senior majoring in information networking and telecommunications (Web develeopment). Andrea Jo Bishop is a junior majoring in justice studies. Marlene Canchola is a junior majoring in radiologic technology. Conner Andrew Erckert is a freshman majoring in justice studies. Haydee Polet Reyes is a freshman majoring in organizational leadership. Karla L. Trimble is majoring in education. Nicholas A. Varvel is a freshman majoring in biology. Drew Curtis Wilson is a senior majoring in health and human performance. Mckenzie K. Zimmerman is a junior majoring in education. Overland Park: Kyleigh Renae Bartlett is a junior majoring in education. Jeffrey Paul Elliott is a junior majoring in management. Shannon M. Elliott is a senior majoring in management information systems. Ashley Lynette Feldkamp is a sophomore majoring in psychology. Darla Jean Wright is a junior majoring in sociology. Prairie Village: Patrick Michael Andries is a freshman. Samantha Ashton Booth is a senior majoring in psychology. Alexis S. Crispin is a sophomore majoring in accounting (public). Chelsea N. Hargrove is majoring in education. Manuela Nunes Hutchison is majoring in education. Rachael Louise Stiles is majoring in education. Hadley Anne Tharp is a junior majoring in justice studies. Spring Hill: Jessica Kate Pollom is a freshman majoring in communication sciences and disorders. Deerfield: Emily Suzanne Ansel is a senior majoring in elementary education. Jordyn Mychelle Crum is a freshman majoring in nursing. Keyton L. McAtee is a senior majoring in elementary education. Cunningham: James Dean Fitzsimmons is a sophomore majoring in agricultural business. Makala Jo Orler is a junior majoring in agricultural business. Kingman: Heather Jean Albers is a senior majoring in elementary education. Jessica Renee Brockleman is a sophomore majoring in education. Murdock: Rebecca M. Pickett is majoring in elementary education. Norwich: Bailey Grace Poe is a sophomore majoring in accounting. Haviland: Elizabeth Hiebert Penner is a freshman majoring in physics. Mindy Michelle Wood is a junior majoring in elementary education. Mullinville: Dena Jean Liggett is a sophomore majoring in nursing. Dighton: Amelia Ann Borell is a freshman majoring in biology (pre-med-pre-dentistry). Clayton Salvatore Capra is a senior majoring in music (music education). Hannah Fae Speer is a senior majoring in agriculture (animal science). Healy: Shannon Dee Ballinger is a senior majoring in education. Kiara Chambrie Sharp is a junior majoring in English. Lansing: Sara Genevieve Meyers is a junior majoring in education. John Eric Riggs is a senior majoring in elementary education. Leavenworth: Sammi Jean Cardinal is a junior majoring in business education (training and development). Rachel Ann Hancock is a senior majoring in elementary education. Bethany Joy Redden is a senior majoring in nursing. Tonganoxie: Mackenzie Lee Cadue is a junior majoring in information networking and telecommunications (Web develeopment). Alissa Ann Donnelly is a junior majoring in international business and economics. Carissa Lidija Mikesic is a sophomore majoring in psychology. Holley Martin Thompson is a senior majoring in communication sciences and disorders. Sylvan Grove: Kylie Lynn Ehrlich is a senior majoring in elementary education. Melanie Lynn Moore is majoring in elementary education. Mound City: Christina Gail Spencer is a junior majoring in education. Parker: Tiffany Jean Singer is a freshman majoring in elementary education. Rebecca A. Smith is a senior majoring in elementary education. Olpe: Krista Kay Vogts is a freshman majoring in education. Marion: Elizabeth Nicole Goentzel is a junior majoring in chemistry. Danielle Brooke Litke is a junior majoring in education. Beattie: Gayle Cecelia Skalla is a junior majoring in education. Jenna Marie Maas is a senior majoring in accounting. Marysville: Michelle Lynne Peeks is a junior majoring in nursing. Oketo: Shayla Ann Novak is a freshman majoring in radiologic technology. Inman: Oaklee Layne Abernathy is a senior majoring in biology (pre-med and pre-dentistry track). Megan Lynn Bergstrom is a sophomore majoring in agriculture (animal science). Molly Magnuson Rohr is a junior majoring in information networking and telecommunications (Web develeopment). McPherson: Kristen Leigh Houston is majoring in education. Raquel Deette Otero is a freshman majoring in communication sciences and disorders. Ashley Nicole Plenert is a sophomore majoring in communication sciences and disorders. Cody Alan Starkel is a freshman majoring in political science. Ashley Marie Wiens is a senior majoring in elementary education. Fowler: Hannah Sophia Heinz is a freshman majoring in biology (pre-physical therapy). Cheyenne Nicole Marrs is a junior majoring in agricultural business. Plains: Tiana Marie Couch is a junior majoring in radiologic technology. Kalli Jo Adams is a senior majoring in elementary education. Emily Rose Brandt is a sophomore majoring in political science. Haley N. Elsen is a senior majoring in elementary education. Aaron James Gengler is a sophomore majoring in business. Arrica Lynn Overmiller is a freshman majoring in radiologic technology. Kevin Matthew Williams is a senior majoring in athletic training. Cawker City: Jaden Robert Flower is a freshman majoring in justice studies. Jordan James Flower is a junior majoring in radiologic technology. Elkhart: Israel Barco is a freshman majoring in chemistry. Rolla: Casey Jo Thomlinson is a senior majoring in agriculture (animal science). Chanute: Justin Dale McCready is a senior majoring in psychology. Pedro A. Flores is a freshman majoring in nursing. Ransom: Logan Blake Jansonius is a sophomore majoring in biology (pre-physical therapy). Lauren T. Sargent is a sophomore majoring in art (graphic design). Almena: Melissa Mae Hawks is a senior majoring in elementary education. Clayton: Diedre Linn Kramer is a junior majoring in biology (botany). Norton: Darcy Ann Bainter is a sophomore majoring in biology (pre-med and pre-dentistry track). Todd Alan Boller is a sophomore majoring in radiologic technology. Jade Oceanna Braun is a senior majoring in social work. Ashley Ann Hildebrand is a sophomore majoring in art (graphic design). Julia Elise Kent is a sophomore majoring in art. Rosemary Lea Vannatta is a junior majoring in general studies. Osage City: Traci Renee Middleton is a senior majoring in elementary education. Elizabeth Olorunfemi is majoring in elementary education. Overbrook: Karla Anne Pagan is a senior majoring in elementary education. Quenemo: Aubry Ann Flory is a freshman majoring in medical diagnostic imaging (ultrasound). Laura Suzanne Stinebaugh is a senior majoring in art (graphic design). Scranton: Brittany D. Riffey is a senior majoring in sociology. Downs: Trystan Blake Schlaefli is a freshman majoring in biology (pre-physical therapy). Natoma: Danica Lee Casey is a junior majoring in elementary education. Osborne: Katie Michelle Girard is a junior majoring in elementary education. Caitlyn Nichole Miller is a sophomore majoring in biology (pre-occupational therapy). Ashlyn Christine Thibault is a senior majoring in sociology. Bennington: Devin Dean Crowder is a junior majoring in justice studies. Ryein Paige Hensley is a freshman majoring in general studies. Danielle Christine Nay is a junior majoring in mathematics (teaching). Dustin Powell Stanley is a freshman majoring in biology (pre-med-pre-dentistry). Minneapolis: Juan Fernando Delacruz-Martinez is a freshman majoring in applied technology. Lucy Deanna Giles is a sophomore majoring in health and human performance (exercise science). Erica Lynn Jones is a sophomore majoring in information networking and telecommunications (media studies). Ashlyn Taylor Macy is a junior majoring in health and human performance. Gunner Mick is a sophomore majoring in technology studies (construction management). Tyler Moeckel is a freshman majoring in agriculture (agronomy). Garfield: Paul Marcus Kirkwood is a senior majoring in information networking and telecommunications (media studies). Larned: Jeret Charles Johnson is a senior majoring in health and human performance. Jessica Mick Johnson is a sophomore majoring in general studies. Alexis Nicole Langdon is a freshman majoring in education. Kelsey Anne Milhon is a junior majoring in radiologic technology. Easton Jon Palmer is a sophomore majoring in nursing. Marley M. Palmer is a freshman majoring in communication. Lauren May Zerr is a freshman majoring in social work. Tristen Kyle Galliart is a junior majoring in organizational leadership. Glade: Kollette Danielle Keeten is a freshman majoring in art (graphic design). Erika K. Norris is a freshman majoring in education. Logan: Katie Mae Becker is a junior majoring in psychology. Whitney Nicole Mulder is a senior majoring in nursing. Dillon J. Schmidt is a sophomore majoring in radiologic technology. Mindy Lauren Gower is a freshman majoring in education. Mandra Imm is a senior majoring in education. Brooke Nicole Vanderplas is a senior majoring in general studies (health promotion). Emmett: Stephani Lynne Robbins is a freshman majoring in health and human performance (sport management). Havensville: Tawni Ann Myers is a senior majoring in education. St. George: Levi Shane Anderson is a junior majoring in technology leadership. St. Marys: Wyatt J. Kolde is a junior majoring in technology studies (construction management). Emmett Gregory Tooley is a freshman majoring in physics. Wamego: Kelsey M. Peterson is majoring in medical diagnostic imaging (ultrasound). Pratt: Briauna Jade Fahrenbruch is a junior majoring in art. Stormy Layne Flemming is a junior majoring in psychology. Dayla Janae Garten is majoring in education. Breann Marie Tilley is a senior majoring in management. Cheyanne Elizabeth Soderlund is a junior majoring in health and human performance (health promotion). Dakota Gene Soderlund is a senior majoring in health and human performance (K-12 teaching and coaching). McDonald: Anna-Lura Elizabeth Frisbie is a freshman majoring in accounting. Tori Lee Sramek is a sophomore majoring in education. Abbyville: Ryce Mckenzie Stuckey is a junior majoring in art (graphic design). Arlington: Ivan Douglas Lobban is a senior majoring in general studies (geosciences). Hutchinson: Christopher Louis Albert is a junior majoring in history. Madyson Jaye Bennett is a senior majoring in psychology. Megan Ann Ellegood is a senior majoring in elementary education. Melissa Maria Maldonado is a senior majoring in elementary education. Jared Ray Ridder is a junior majoring in biology (pre-med and pre-dentistry track). Deborah Jane Stoughton is majoring in business education (teacher licensure). Kristen Elise Taylor is a junior majoring in education. Alicia Le Wilson is a senior majoring in information networking and telecommunications (Web develeopment). Evan Christopher Wondra is a junior majoring in technology studies (industrial). South Hutchinson: Bret Charles Konrade is majoring in education. Belleville: Kimberly Cherie Larson is a senior majoring in management. Munden: Lacie Taylor Shoemaker is a senior majoring in early childhood unified. Republic: Brianne M. Little is a sophomore. Sterling: Hunter Ryan Hewitt is a sophomore majoring in agricultural business. Jill D. Oden is a senior majoring in general studies (child development). Austin James Schweizer is a senior majoring in agriculture (agronomy). Manhattan: Stefanie Jannee Morris is a junior majoring in general studies (human services). Rhianna Claudine Nelson is a senior majoring in general studies (child development). Plainville: Cheyenne Leray Armbruster is a junior majoring in biology (pre-med and pre-dentistry track ). Dalton John Brown is a senior majoring in technology studies (construction management). Brianna Christine Casey is a freshman majoring in health and human performance. Aaron Dean Fisher is a freshman majoring in chemistry. Samantha Marie Reif is a sophomore majoring in health and human performance (sport and exercise therapy). Dylan Robert Wiesner is a sophomore majoring in technology studies (construction management). Natalie Skylar Thomas is a freshman majoring in music (performance). Bison: Benjamin Thomas Cornwell is a sophomore majoring in art (studio). Eleanor Astrid Cornwell is a freshman majoring in art. Matthew Shaun Crotinger is a junior majoring in agriculture (agronomy). La Crosse: Rebecca Marie Barnett is a sophomore majoring in chemistry. Sarah Lynn Holzmeister is a senior majoring in English (writing). Liebenthal: Renee Christine Legleiter is a senior majoring in management (human resource management). Otis: Hunter Ian Macdonald is a junior majoring in technology studies (industrial). Timken: Kimberly Rose Pechanec is a junior majoring in athletic training. Shawna Rae Serpan is a freshman majoring in biology (education). Bunker Hill: Sarah Paige Leatherman is a sophomore majoring in social work. Gorham: Kayce Nicole Dreiling is a senior majoring in organizational leadership. Lucas: Michaela J. Merchant is a freshman majoring in psychology. Luray: Garrett Fredrick Keith is a junior majoring in health and human performance (recreation). Russell: Alicia Lorraine Gibson is a sophomore majoring in biology (wildlife). Savanna Rae Huff is a sophomore majoring in finance. Jordan Alexander Kaufman is a senior majoring in management. Jared K. Lawler is a sophomore majoring in history. Michael Brady Vonfeldt is a senior majoring in marketing. Waldo: Payton Bradley Zweifel is a freshman majoring in biology (pre-med and pre-dentistry track). Brookville: Ashley Nicole Crump is a senior majoring in elementary education. Whitney Jo Albers is a senior majoring in nursing. Miranda Grace Basinger is a freshman majoring in education. Brian M. Bell is a senior majoring in education. Damion Dashon Cooper is a sophomore majoring in health and human performance (sport management). Danielle Rae Donmyer is a senior majoring in nursing. Kailey Rose Ericsson is a sophomore majoring in education. Zachary Thomas Fief is a sophomore majoring in health and human performance (sport management). Rachel Goldsmith is majoring in education. Khanthavivanh Khamdalanikone is majoring in elementary education. Taylor Anthony Krahl is a senior majoring in technology studies (industrial). Kurt Jay Lange is a junior majoring in psychology. Clay Jackson Peppiatt is a junior majoring in art (graphic design). Meghan Renee Post is a senior majoring in art (graphic design). Allyne Camille Purdy is a junior majoring in general studies. Morgan Beatrice Soldan is a junior majoring in general studies (education). Michael David Stueve is a freshman majoring in art. Shaelin Dawn Sweet is a sophomore majoring in history (secondary education). Theresa Duc Tran is a senior majoring in elementary education, honors. Scott City: Zachery Earl Glass is a sophomore majoring in computer science. Dakota Allen Hayes is a senior majoring in health and human performance. Warren Dean Kropp is a sophomore majoring in biology (pre-physical therapy). Callan Lynn Rice is a junior majoring in early childhood unified. Kelly A. Wycoff is a sophomore. Andale: Tucker Max O'Hair is a senior majoring in biology (education). Cheney: Macy M. Becker is a junior majoring in communication (public relations). Alexis Danielle Henning is a senior majoring in accounting. Haley N. Jacobs is a junior majoring in radiologic technology. Mallary Leis is a junior majoring in art (graphic design). Clearwater: Haley Amber Weidman is a junior majoring in education. Colwich: Anna Ruth Gerber is a sophomore majoring in business education (teacher licensure). Ashlynn Belen Sandoval is a junior majoring in elementary education. Derby: Heather Jo Anderson is a junior majoring in sociology. Annelise Sarah Irick is majoring in education. Zachary Dayne Reece is a freshman. Ainsley Katherine Smith is a sophomore majoring in communication sciences and disorders. Rebekah Spainhour is a junior majoring in biology (pre-veterinary). Garden Plain: Jodie Patricia Dold is a senior majoring in elementary education. Julia Marie Gorges is a freshman majoring in biology (pre-med and pre-dentistry track). Adriana Marie Redmon is a freshman majoring in education. Goddard: Regan L. Baldwin is majoring in education. Riley Ann Dohmeier is a freshman majoring in art. Valeen Sheree Palmer is a senior majoring in elementary education. Haysville: Milisa Rashell Chilcote is a senior majoring in management (human resource management). Caitlin R. Edwards is a senior majoring in elementary education. Kaitlin Michelle Kindle is a senior majoring in organizational leadership. Kechi: Morgan Marie Hankins is a freshman majoring in nursing. Maize: Janette Jolee Dillon is a sophomore majoring in education. Kelley Nicole Stewart is majoring in elementary education. Park City: Carrie Dawson is a senior majoring in early childhood unified. Kirstan D. Hanson is a senior majoring in art. Byron E. Hummon is a junior majoring in management. Chelsea Faith Jackson is a sophomore majoring in health and human performance. Susan Amelia Wolfe is a senior majoring in elementary education. Viola: Katlyn Marian Pauly is a sophomore majoring in communication. Wichita: Ian Paul Blankinship is a senior majoring in information networking and telecommunications (Web develeopment). Misty D. Brussow is majoring in elementary education. Autumn Dawn Denayer is majoring in elementary education. Dena Elaine Devereaux is a sophomore majoring in education. Elizabeth Devereaux is a sophomore majoring in education. Tyler James Dryden is a senior majoring in health and human performance (recreation). Steven Lee Grimstead is a junior majoring in management information systems. Michelle Lee Harger-West is a senior majoring in elementary education. Nicole Morgan Hernandez is a junior majoring in art education. Sarah E. Hogan is a senior majoring in accounting (public). Lindsey Danae Hostetler is a junior majoring in elementary education. Tessa Laine Jacobs is a senior majoring in elementary education. Erin Megan Lau is a senior majoring in psychology. Justine Michelle Lies is a senior majoring in education. Anthony R. Llamas is a sophomore majoring in health and human performance (sport and exercise therapy). Tessa S. Luke is a senior majoring in education. Brittani Nicole Markano is a junior majoring in justice studies. Kathryn Grace Mason is a sophomore majoring in art. Megan Ann Maze is majoring in elementary education. Angela Dianne McGill is majoring in education. Anna R. Olsen is a freshman majoring in nursing. Erin Elizabeth Pascal is a freshman majoring in art (graphic design). Kaitlyn Mai Pham is a sophomore majoring in radiologic technology. Krista Diane Schrag is majoring in elementary education. Alisa Lynn Seaman is a sophomore majoring in psychology. Lindsay Anne Smith is a senior majoring in organizational leadership. Richard Sean Speakman is a junior majoring in international business and economics. Brianna Spexarth is a freshman majoring in management. David Wayne Springs is a sophomore majoring in information networking and telecommunications (Web develeopment). Daniel Jarod Sublett is a junior majoring in information networking and telecommunications (Web develeopment). Rachel Lynn Thomas is a senior majoring in education. Karina Vargas is a senior majoring in sociology. Christina Kay Yaeger is a junior majoring in sociology. Liberal: Lexi Chanell Delzeit is a junior majoring in education. Jhoselin Dominguez is a freshman majoring in art. Katherine Grac Hernandez-Barahona is a freshman majoring in radiologic technology. Maira M. Regalado is a sophomore majoring in general studies. Eric Dean Volden is a junior majoring in sociology. Preston Cull Whisenant is a junior majoring in sociology. Topeka: Lydia Grace Bender is a junior majoring in physics. Tanya Christine Beninga is majoring in nursing. Tena Renee Bouton is a senior majoring in general studies (child development). Rachel J. Conley is a junior majoring in management (human resource management). Cory Michael Cowger is a senior majoring in information networking and telecommunications (computer networking). Marcy Dalrymple is majoring in early childhood unified. Abbigail June Eisenhut is a junior majoring in nursing. Kristen Farris is a senior majoring in organizational leadership. Brenda Ann Hahn is a senior majoring in general studies (education). Shana Dyan Halloran is a freshman majoring in information networking and telecommunications (computer networking). Mckenzie Rae Johnson is a junior majoring in medical diagnostic imaging (ultrasound). Nicole Marie Montague is a senior majoring in communication sciences and disorders. Samantha M. Montgomery is a freshman majoring in biology (pre-med and pre-dentistry track). Justin Luke Montney is a sophomore majoring in health and human performance (sport and exercise therapy). Jesse Joan Nioce is a junior majoring in management. Marissa Ann Nuss is a freshman majoring in management. Sarah Nicole Pimentel is a junior majoring in medical diagnostic imaging. Julie Prosser is a junior majoring in psychology. Vanessa Marie Robinson is a junior majoring in education. Tyler Austin Russell is a junior majoring in political science. Carrie Stead is a junior majoring in education. Cleave Felicia Van is a senior majoring in agriculture (animal science). Joselyne Abigail Villa-Flores is a freshman majoring in accounting. Miranda Faye Wilson is a senior majoring in psychology. Wakarusa: Katie Elizabeth Metz is a freshman majoring in radiologic technology. Hoxie: Samantha Leigh Brown is a freshman majoring in art (studio). Brandie Lynette Irby is a senior majoring in education. Kayla Ann Meurisse is a junior majoring in nursing. Selden: Leea Marie Juenemann is a junior majoring in psychology. Jalyn Marie Shaw is a sophomore majoring in communication sciences and disorders. Studley: Cody Heskett is a sophomore majoring in agriculture (animal science). Goodland: Kirsten M. Dutton-Lamb is a senior majoring in geology. Allison Caitlin Giersch is a senior majoring in elementary education. Paige Phillips is a junior majoring in English (teaching). Bracelyn Victoria Redlin is a junior majoring in accounting. Hannah Arinne Sanderson is a freshman majoring in information networking and telecommunications (media studies). Raquel Tomsic is a freshman majoring in biology (education). Gaylord: Michaela Jenae Sasse is a senior majoring in biology (pre-med and pre-dentistry track). Kensington: Daniel Stephen Hill is a senior majoring in music (music education). Smith Center: Saige Marie Blue is a senior majoring in early childhood unified. Morgan Lynn Lorenzen is a senior majoring in elementary education. St. John: Schuyler Lynn Brown is a sophomore majoring in health and human performance (sport and exercise therapy). Shane Fitzgerald Keller is a sophomore majoring in general studies (massage therapy). Ava Kathleen Long is a senior majoring in general studies (education). Hugoton: Chase W. Mills is a senior majoring in social work. Belle Plaine: Megan Oria Doyle is a junior majoring in elementary education. Katelyn Elizabeth Seba is a junior majoring in education. Jennifer Sara Turner is majoring in elementary education. Mulvane: Jessica Ann Mitchell is a senior majoring in early childhood unified. Wellington: Eric Steven Adams is a senior majoring in general studies (historical). Brewster: Layton Wayne Werth is a freshman majoring in agriculture (agronomy). Colby: Skylar Barrett is a junior majoring in justice studies. Aaron Russell Faber is a freshman majoring in international business and economics. Jessi K. Kriss is a junior majoring in communication sciences and disorders. Connor Michael Mountford is a freshman majoring in political science. Jay Thomas Ziegelmeier is a freshman majoring in agricultural business. Rexford: Jordan Leigh Christensen is a junior majoring in nursing. Kylie Kay Jones is a junior majoring in agriculture (animal science). WaKeeney: Shaylee Jo Flax is a freshman majoring in agriculture (animal science). Blake Wayne Fritts is a senior majoring in technology studies (construction management). Nicole Jean Hendrix is a freshman majoring in psychology. Larissa Antionette Howard is a freshman majoring in geology. Ella Anna Sherwood is a sophomore majoring in communication sciences and disorders. Cameron Michael Staples is a junior majoring in technology studies (construction management). Madeline Jane Muller is a freshman. Sharon Springs: Ivan Gonzalez Montes is a sophomore. Nick Bradford Smith is a junior majoring in agricultural business. Wallace: April Marie Mays is a sophomore majoring in communication sciences and disorders. Weskan: Kelsey Anne Hale is a junior majoring in nursing. Clifton: Nathan Preston Schaefer is a sophomore majoring in history (secondary education). Palmer: Kendra Dawn Bargman is a freshman majoring in business. Alison Sue Wohler is a senior majoring in agricultural business. Washington: Jordanna Marie Beikman is a freshman majoring in nursing. Leoti: Kassandra Marie Baker is a senior majoring in tourism and hospitality management. Jesus Alberto Gallegos-Ornelas is a junior majoring in accounting (public). Teneille Marie Whitham is a junior majoring in nursing. Marienthal: Tracey Lee Baker is a senior majoring in education. Bonner Springs: Trevor James Hickman is a junior majoring in nursing. Edwardsville: Melissa Irene Cooper is a senior majoring in education. Kansas City: Vilma Y. Maldonado is a junior majoring in management. Kelcy D. Shackelford is a junior majoring in sociology. Mariah E. Smith is a sophomore majoring in psychology. Weaver: Dixie Leah McGahan is a junior majoring in psychology. Wasilla: Corey A. Bjerken is a junior majoring in psychology. Gilbert: Claudia Adriana Vazquez is a junior majoring in nursing. Phoenix: Julia Megan Masters is a senior majoring in tourism and hospitality management. Surprise: Kylie Marie Strand is a junior majoring in health and human performance (health promotion). Adelanto: Raiden Jace Martinez is a sophomore majoring in general studies (criminal justice). Bakersfield: Jonathan Emil Harker is a freshman majoring in information networking and telecommunications (computer networking). Encino: Andrea Jamiel is a junior majoring in psychology. Exeter: Gregory James Mullins is a senior majoring in general studies (literature). Fairfield: Keshia Craig is majoring in information networking and telecommunications. Fort Irwin: Danielle Donna Barta is a junior majoring in management (human resource management). Greenfield: Justin Alec Cremeans is a junior majoring in information networking and telecommunications (computer networking). Irvine: Jacob R. Cadwell is a junior majoring in political science. Los Angeles: Nealey Gail Lingafelter is a senior majoring in sociology. Morro Bay: Holly Anne Brown is a senior majoring in management (human resource management). Mountain House: Bridget C. Stansky is a senior majoring in sociology. Ramona: Melissa Ann Crogan is a freshman majoring in management. San Diego: Kristina Michelle Bowles is a sophomore majoring in psychology. Jason Lee Hardy is a senior majoring in management information systems. Stanton: Christina Ann Beckwith is a senior majoring in general studies (education). Vallejo: Hayley Michelle Velasquez is a junior majoring in psychology. Arvada: Haley Ann Weidemann is a freshman. Aurora: Juana Guadalupe Estrada-Hernandez is a senior majoring in art. Carlos Ernesto Linares is a senior majoring in computer science. Brighton: Mckenzie Louise Motes is a junior majoring in chemistry. Brush: Kristina Amy Davis is a junior majoring in justice studies. Burlington: Kristin Kay Allacher is a junior majoring in English. Calhan: Mariam Alexandra Sears is a freshman majoring in medical diagnostic imaging. Centennial: Danielle Nichole Harris is a junior majoring in psychology. Chloe Nicole Logan is a freshman majoring in communication sciences and disorders. Cheyenne Wells: Kenli Shea Roth is a freshman majoring in nursing. Brenna Lynne Stutz is a junior majoring in health and human performance (sport and exercise therapy). Colorado Springs: Daniel N. Fitts is a junior majoring in psychology. Garrett Keith Holle is a senior majoring in biology (pre-physical therapy). Dana Jo Larrabee is a junior majoring in business education (teacher licensure). Lucille Grace Partlow-Loyall is a sophomore. Jacob Nathanael Rainey is a senior majoring in general studies (leadership). Cheyanne Marie Toler is a junior majoring in mathematics (teaching). Del Norte: Lisa Diane Campbell is a senior majoring in general studies (education). Denver: Jade Catalina Singleton-Reich is a junior majoring in organizational leadership. Elizabeth: Tyler Dean Grant is a sophomore majoring in information networking and telecommunications (Web develeopment). Evans: Brianna Sue Hardy is a sophomore majoring in English (writing). Evergreen: Hailey A. Davey is a senior majoring in mathematics (teaching). Jared J. Tadlock is a senior majoring in art (studio). Firestone: Emma Christine Wright is a freshman majoring in technology studies (industrial). Highlands Ranch: Elynora Rose Borgen is a freshman majoring in art. Lauren Nicole Solzman is a junior majoring in tourism and hospitality management. Hotchkiss: Vikash Evans Hypio is a senior majoring in finance (economics). Lake George: Laura Sue Davis is a senior majoring in elementary education. Lakewood: Austin James Foster is a junior majoring in business. Gabrielle A. Makatura is a senior majoring in international business and economics. Baylie Jordyn Schmitz is a sophomore majoring in biology (pre-occupational therapy). Longmont: Kailey Nanette Klibbe is a freshman majoring in nursing. Alicia Nicole Vigil is a senior majoring in education. Loveland: Samantha Paige Villarreal is a junior majoring in education. Mead: Ryan P. Aragon is a freshman majoring in health and human performance (sport and exercise therapy). Morrison: Megan Jessie Garcia is a freshman majoring in political science. Parker: Alexis Nicole Hansen is a sophomore majoring in nursing. Kayla Rae Nelson is a sophomore majoring in education. Pamela Sue Nelson is a senior majoring in elementary education. Leslie Ann Strahan is a senior majoring in justice studies. Snyder: Meridith Joy Brandenburg is a junior majoring in management. Strasburg: Jordan Dodge is a senior majoring in health and human performance (K-12 teaching and coaching). Rilee Marie Krier is a senior majoring in computer science. Liesel Diamond Sims is a junior majoring in management (human resource management). Stratton: Morgan Marie Schulte is a senior majoring in health and human performance (K-12 teaching and coaching). Westminster: Abdulahad Pasha is a senior majoring in information networking and telecommunications (computer networking). Windsor: Evan Taylor Pinkham is a senior majoring in general studies. Wray: Paulyna M. Alcorn is a freshman majoring in biology (cellular-molecular). Romario Pureco-Diaz is a sophomore majoring in agriculture. Yuma: Ashley Nicole Newbury is a freshman majoring in radiologic technology. Gulf Breeze: Shelley Atkinson is a junior majoring in management. Jacksonville: Carly M. Weeks is a junior majoring in business education (teacher licensure). Miami: Leslie Alfonso is a junior majoring in education. Valrico: Chelsea Hatfield is a sophomore majoring in general studies. West Palm Beach: Helene Previl is a senior majoring in general studies. Augusta: Brandi M. McCorkle is a senior majoring in management. Fort Benning: Scotty Lee Brown is a junior majoring in justice studies. McDonough: Curtis D. Spencer is a junior majoring in general studies. Savannah: Sara Brown is a senior majoring in international business and economics. Snellville: Medina Delkic is a sophomore majoring in psychology. Stockbridge: Barbara Lynn Shiversstovall is a senior majoring in psychology. Thomasville: Rodney Harmon Mercer is a sophomore majoring in psychology. Meridian: Alyssa Horn is a senior majoring in management. Chicago: Aalia Jahaan Abdullah is a sophomore majoring in education. Raihannah Yasmeen Abdullah is a freshman majoring in education. Taalib Saadiq Abdullah is a sophomore majoring in education. Mount Pulaski: Janson Michael Cooper is a junior majoring in agriculture (animal science). Peoria: Kristina Earlene McCarty is a junior majoring in general studies (leadership). Raymond: Jacy Lee Littrell is a junior majoring in agriculture (animal science). Rockford: Joshua Alexander Lamere is a senior majoring in management. West Frankfort: Bonnie J. Walton is a senior majoring in management (human resource management). Lafayette: Karen C. Rollins is a senior majoring in sociology. Elizabethtown: Phyllis Elaine Nichols is a sophomore majoring in psychology. Lafayette: Joddea Sheatelle Fisher is a senior majoring in international business and economics. Frederick: Somphaphone Laos Kakhankham is a senior majoring in information networking and telecommunications (Web develeopment). Frostburg: Nicholas Joseph Costello is a junior majoring in justice studies. Springfield: Joseph Mueller is a senior majoring in information networking and telecommunications (Web develeopment). Annandale: Heather Ann Peters is a sophomore majoring in psychology. Bemidji: Benjamin Andrew Pope is a junior majoring in organizational leadership. Gulfport: Marla Ann Hogan is a senior majoring in general studies. Branson: William Clark is a freshman majoring in general studies. Carl Junction: Lauren Tiffany Joyner is a sophomore majoring in psychology. Columbia: Emile J. Carter is a senior majoring in art education. Eminence: Courtney E. Dimucci is a junior majoring in psychology. Freeman: Deona Lynn Sherrill is a senior majoring in information networking and telecommunications (Web develeopment). Grain Valley: Kimberly Ann Dunn is a senior majoring in management. Jefferson City: Olusegun Gbologe is a senior majoring in organizational leadership. Kansas City: Holly Marie Burk is majoring in elementary education. Kirksville: Stephanie Alaine Shipman is a senior majoring in management (human resource management). Lee's Summit: Kevin Michael Jones is a junior majoring in mathematics (teaching). Stephanie Renee Rand is a junior majoring in general studies (human services). O'Fallon: Savannah Mae Price is a sophomore majoring in psychology. Osage Beach: Dylan Kessler Hymes is a junior majoring in health and human performance (sport and exercise therapy). Shae Lynn Hymes is a senior majoring in management. Richland: Jessy Janeene Maddux is a freshman majoring in agriculture. Smithville: Isaac Andrew Stidham is a senior majoring in management information systems. Jamie Sue Svatos is a junior majoring in psychology. Darby: Breanna Lene Slanger is a senior majoring in psychology. Alma: Brandie Sue Janssen is a junior majoring in nursing. Bartley: Katelyn F. Sughroue is a senior majoring in agriculture (education). Beaver City: Abigail Leigh Eden is a freshman majoring in athletic training. Broken Bow: Robert K. Mayor is a senior majoring in computer science. Callaway: Jordan Layne Rush is a freshman majoring in education. Cedar Bluffs: Halcyon Frank is majoring in education. Cozad: Bryce Stephen Nemeth is a freshman majoring in biology (pre-med and pre-dentistry). Elkhorn: Collin Robert Point is a freshman majoring in business. Eustis: Morgan A. Smith is a senior majoring in agriculture. Jacob Veldon Morrow is a sophomore majoring in education. Hastings: Sarah K. Jarmer is a junior majoring in English (teaching). Holdrege: Rachel Elizabeth Robinson is a senior majoring in art (studio). Reinette Strydom is a junior majoring in radiologic technology. Lindsay Renee Warning is a freshman majoring in art education. Lexington: Angelica Maria Deanda is a freshman majoring in psychology. Rachel M. Linch is a senior majoring in elementary education. Lincoln: Hannah L. Jurgens is a junior majoring in health and human performance (sport management). McCook: Luke Richard Lichty is a freshman majoring in management. Michael Todd Mendenhall is majoring in health and human performance (K-12 teaching and coaching). Clayton Michael Skolout is a sophomore majoring in agricultural business. North Platte: Delaney Shay Green is a freshman. Casey J. Roy is a senior majoring in management information systems. Omaha: Sam Erickson is a senior majoring in sociology. Orleans: Lucas W. Robison is a senior majoring in agriculture (agronomy). Oxford: Shelisa Mary Brooks is a freshman majoring in psychology. Austin Wayne Krejdl is a freshman majoring in agricultural business. Stapleton: Brianna Shae Boyer is a freshman majoring in social work. Wauneta: Colby Ryan Skelton is a senior majoring in management. Henderson: Jacob Andrew Wagner is a senior majoring in general studies (information networking and telecommunications). Las Vegas: Joseph G. Manibusan is a sophomore majoring in management information systems. Reno: Jana Borden is a junior majoring in sociology. Hamilton: Jasmine Marie Purnell is a sophomore majoring in sociology. Albuquerque: Ashley Amanda Bringhurst is a sophomore majoring in psychology. Bayside: Kwi Hyang Ha is a junior majoring in nursing. Corona: Kuanxxis Lorraine Guerra is a freshman majoring in organizational leadership. Howard Beach: Danielle Girard is a sophomore majoring in psychology. Huntington: John S. Livigni is a junior majoring in information networking and telecommunications (computer networking). Johnson City: Alexandria Ming-Lynn Troupe is a sophomore majoring in psychology. New York: Joao Paulo Castrozerba is a freshman majoring in physics. Daniel J. Rossano is a junior majoring in general studies (general business). Oswego: Melody Mary Cappello is a junior majoring in information networking and telecommunications (Web develeopment). Asheboro: Randy Scott Laws is a junior majoring in education. Chapel Hill: John Matthew Traversaro is a senior majoring in information networking and telecommunications (Web develeopment). Mount Pleasant: Kathryn Elizabeth Jacobs is a junior majoring in psychology. Thomasville: Sarah Lynn Martin is a senior majoring in marketing. Edmond: Justin Paul Roemer is a senior majoring in biology (wildlife). Nash: Jaime Lynn Elson is a senior majoring in early childhood unified. Oologah: Brinley Renee Evans is a sophomore majoring in biology (pre-med and pre-dentistry track). Yukon: Karissa Janea Langlois is a junior majoring in justice studies. Bend: Megan Boyer is a senior majoring in general studies (child development). Vieques: Tiann Fields is a freshman majoring in general studies (psychological). Central Falls: Angel Eduardo Gavidia is a senior majoring in information networking and telecommunications (computer networking). Anderson: David Alexander Scanlan is a senior majoring in general studies (networking). Beaufort: Angela Whidby Scheidt is a junior majoring in education. Mount Pleasant: Beth Ann Breitinger is a senior majoring in management (human resource management). Caldwell: Rachael Victoria Hawkins is a senior majoring in general studies. Canyon: Micah Mckenzie Wells is a senior majoring in elementary education. Carolynn Jean Garrison is a senior majoring in management (human resource management). Hurst: Kathleen G. Evans is a senior majoring in general studies (human services). Joshua: Kelly Musgraves is a junior majoring in general studies. Katy: Xylliikwa Victoria Tillman is a junior majoring in psychology. Kempner: Shannon Muff is a sophomore majoring in psychology. Perryton: Brenda L. Castro is a junior majoring in medical diagnostic imaging. Round Rock: Jamie Rae Smith is a junior majoring in psychology. Ogden: Kyler Jeffree Rynearson is a senior majoring in elementary education. Burlington: Joshua Paul O'Floinn is a senior majoring in nursing. Chester: Lasondra Renee Reid is a senior majoring in general studies (chemistry). Fairfax: Nabila Abdiaziz Guled is a junior majoring in organizational leadership. Spring Hill: Sandy Jane Deskins is a senior majoring in general studies (literature). Stafford: Beverly Kim Williamson is a junior majoring in general studies (general business). Virginia Beach: Sara Elizabeth Standring is a senior majoring in psychology. Olympia: Basil Ryen is a freshman majoring in information networking and telecommunications (Web develeopment). Tacoma: Phyllis A. Wyatt is a senior majoring in education. Elkins: Celestina Adele Holler is a senior majoring in justice studies. Ravenswood: James Michael Ihle is a junior majoring in political science. Fond du Lac: Ryan James Gough is a freshman majoring in medical diagnostic imaging (ultrasound). Sun Prairie: Celia Elise Zeinert is a sophomore majoring in general studies. Tomah: Ernest Richard Hohensee is a sophomore majoring in psychology. Laramie: Jordan Paige Anderson is a senior majoring in management. Nassau: Michael Keith Robinson is freshman majoring in accounting. Sherwood Park: Jake H. Lanferman is freshman majoring in management. Hangzhou: Gong Zhang is senior majoring in music. Lanzhou: Min Chen is senior majoring in general studies. Mizhi: Chaoyue Zhao is senior majoring in music (music technology). Shaanxi: Huixiu Zhang is senior majoring in general studies. Shenyang: Yuejia Qian is sophomore majoring in organizational leadership. Shenzhen: Rujia Qiu is a freshman. Xi'an: Xin Liu is senior majoring in general studies. Yueqing: Lulu Ye is senior majoring in music. Gaza: Ahmed H. Aliwaisi is senior majoring in chemistry (biochemistry). Herborn: Igor Lisovski is a freshman. Ludwigsburg: Jan Huber is a junior. Luenen: Sina Isabell Guse is a junior. Milan: Matteo Bigliardi is a freshman. Clarendon: Zuri Akili Richards is senior majoring in information networking and telecommunications (computer networking). Ayer Tawar: Caleb Huei Quay is senior majoring in general science. Ikorodu: Melody Adenipekun is junior majoring in nursing. Lagos: Obianuju Tobechukwu Ibe is freshman majoring in nursing. Islamabad: Umar Farooq is sophomore majoring in information networking and telecommunications (Web development). Dammam: Mogdad M. Boudy is senior majoring in management information systems. Madinah: Abdullah Mansour Alharbi is senior majoring in information networking and telecommunications (computer networking). Riyadh: Abdulrahman Alandas is senior majoring in information networking and telecommunications. Rayan M. Almubayrik is senior majoring in information networking and telecommunications. Daejeon: Jiyoung Baek is a junior. Gang Dong: Gyuseung Hwang is a sophomore. Hwaseong: Oohyung Jang is a freshman. Seocho: Chaeyeon Kim is a sophomore.